The 2008 Ms 8.0 Wenchuan earthquake triggered a large number of extensive landslides. It also affected geologic properties of the mountains such that large-scale landslides followed the earthquake, resulting in the formation of a disaster chain. On 10 July 2013, a catastrophic landslide–debris flow suddenly occurred in the Dujiangyan area of Sichuan Province in southeast China. This caused the deaths of 166 people and the burying or damage of 11 buildings along the runout path. The landslide involved the failure of ≈1.47 million m3, and the displaced material from the source area was ≈0.3 million m3. This landslide displayed shear failure at a high level under the effects of a rainstorm, which impacted and scraped an accumulated layer underneath and a heavily weathered rock layer during the release of potential and kinetic energies. The landslide body entrained a large volume of surface residual diluvial soil, and then moved downstream along a gully to produce a debris flow disaster. This was determined to be a typical landslide–debris flow disaster type. The runout of displaced material had a horizontal extent of 1200 m and a vertical extent of 400 m. This was equivalent to the angle of reach (fahrböschung angle) of 19° and covered an area of 0.2 km2. 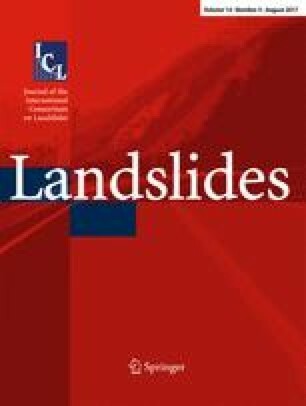 The background and motion of the landslide are described in this study. On the basis of the above analysis, dynamic simulation software (DAN3D) and rheological models were used to simulate the runout behavior of the displaced landslide materials in order to provide information for the hazard zonation of similar types of potential landslide–debris flows in southeast China following the Wenchuan earthquake. The simulation results of the Sanxicun landslide revealed that the frictional model had the best performance for the source area, while the Voellmy model was most suitable for the scraping and accumulation areas. The simulations estimated that the motion could last for ≈70 s, with a maximum speed of 47.7 m/s. This study was supported by the National Natural Science Foundation of China (nos. 41472295 and 41302246). The authors express their gratitude to Prof. Xing Aiguo and Drs. Wang Lei and He Kai for the kind support and guidance. We are grateful to Prof. O. Hungr for supplying a copy of the DAN3D software.